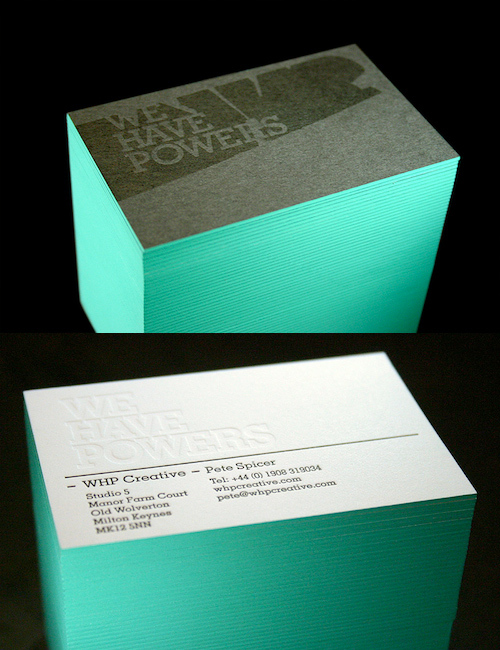 Duplex business cards for WHP Creative. The cards are a Cranes Crest / Accent Fresco 700gsm duplex, letterpress printed black and blind deboss on the Cranes, black ink on the Fresco. The black logo on the Fresco was originally intended to be a blind deboss but we advised a black ink to help lift it. We can edge paint a Duplex stock and these were painted in a vibrant aqua green.